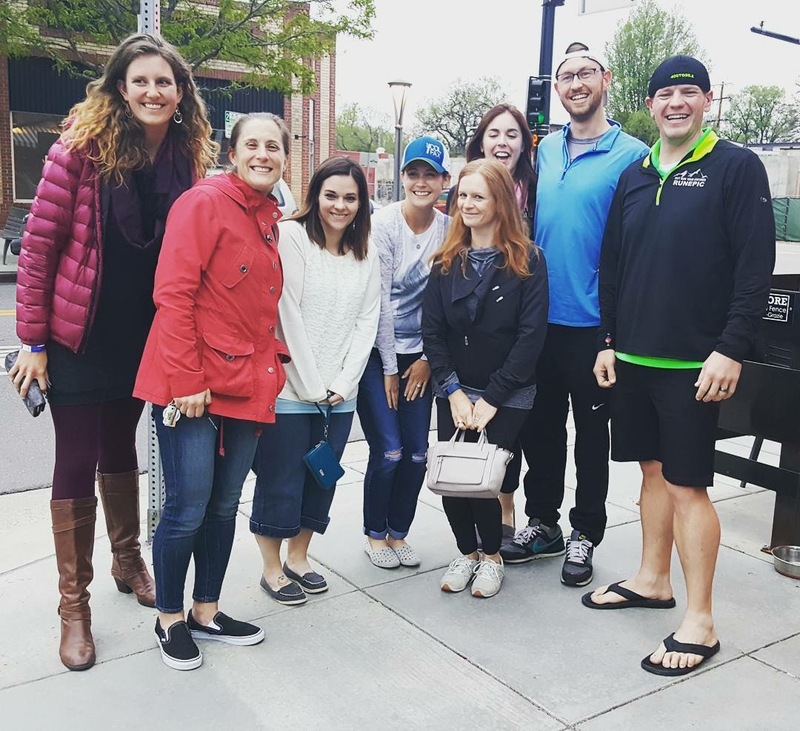 One of my favorite bloggers and amazing sorority sisters, Danielle (aka T-Rex Runner) reported on her Instagram Stories last night that she was attending her first spin class in some time. She got to try out the new CycleBar studio in Greenville, SC, which is part of a chain of studios around the U.S. Over the summer I finally took the plunge and went to my very first spin class, also at CycleBar in the Denver metro area, and boy was I in for a wild ride (literally)! I wouldn’t particularly call myself an adventurous person. I am very much a creature of habit, and I plan out everything from my vacation leave for the next year (I kid you not, I have it all planned through July) to what I am going to wear tomorrow for work. It usually takes quite a bit of convincing, or at least a solid explanation for me to try something new. 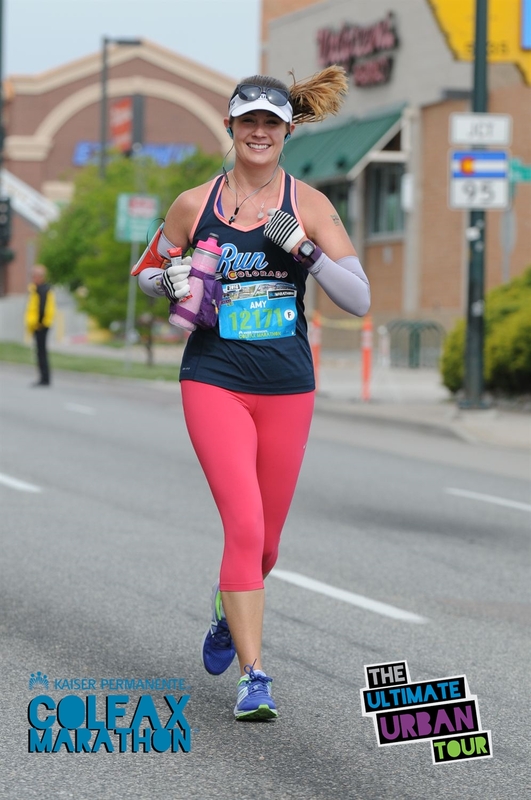 When I started running, it was because I had researched the benefits, training plans, and feasibility, along with recommendations from friends and family with detailed accounts of how they got started. Similarly when I started going to yoga sculpt classes, after getting the recommendation from one of my dearest friends and workout buddies, I had her explain the flow, the types of exercises and her own experiences with excellent precision. I wouldn’t say I am a control freak… maybe more like a control enthusiast. So when my friend, Samantha, came to visit over the summer, she being a certified cycling instructor, I made her go with me to my very first cycle class. I can’t lie, it terrified me. Maybe I had visions of that episode of the “Unbreakable Kimmy Schmidt” in my head, or the fact that I didn’t even learn to ride a bike until I was 13 thanks to my neighbor, Lauren, but whatever it was, I assumed this would end me. Seriously terrifying. This is how I die. Everyone should go to their first cycle class with a certified instructor. It’s the best ever. Samantha showed me how to set up my bike, explained tap backs, the positions on the handle bars, the push-ups and side-to-side movements, and everything in between. She even explained not only how to clip in, but how to unclip from the bike (which after an intense class with very wobbly legs is easier said than done). I don’t think I could have made it through that first class without her! Cycling is such an incredible form of cross-training that has been essential in my marathon training plan. Furthermore, cross training is a huge component for any runner, enhancing power, efficiency and very often speed. It also helps prevent injuries by balancing the muscles you utilize. Check out this awesome article by Runner’s World about the eight major benefits of cross training. I know that for me personally the combination of yoga, sculpt classes, Zumba and cycling, it’s significantly improved my endurance and speed in running. These classes typically flow between speed work and endurance (“hill” climbs). The higher your resistance, the harder it is to pedal, and it can mimic an actual hill climb. The playlist is crucial to a good class. The songs themselves need to have a great and easy to find rythm that dictate the RPM (revolutions per minute). The faster the beat, the higher the RPM, and often lower the resistance. The slower the beat, the lower the RPM, and the higher the resistance. You get the idea. A great class flows through these two ideas, and even better, can utilize one song to work for both concepts. Sweating it out, CycleBar style. Since my first class back in July, I have begun cycling more, both at CycleBar, as well as StarCycle, another national chain of cycling studios. The two are quite different in their approach. CycleBar is more about stats, technology, and a modern club-like atmosphere. CycleBar tends to be more about the community, skill-building, and personal experience. Both are amazing for different reasons, and both have given me an amazing workout. Depending on your preference, there is a cycling studio out there for you too! I definitely know this to be true, because I somehow managed to convince the hubs to join me (he too was a novice cycling class participant), and now he keeps ending up with the highest stats in the class! What cycling studios do you like? Do you prefer your classes to be more about stats and competition, or to maximize your own ride? A few weekends ago I found myself in the heart of my old “hometown,” if you can call D.C. a hometown, of course. When in Rome, do as the Romans do. Or when in D.C., run around the monuments and pretend you’re in Rome. Whatever works, right? 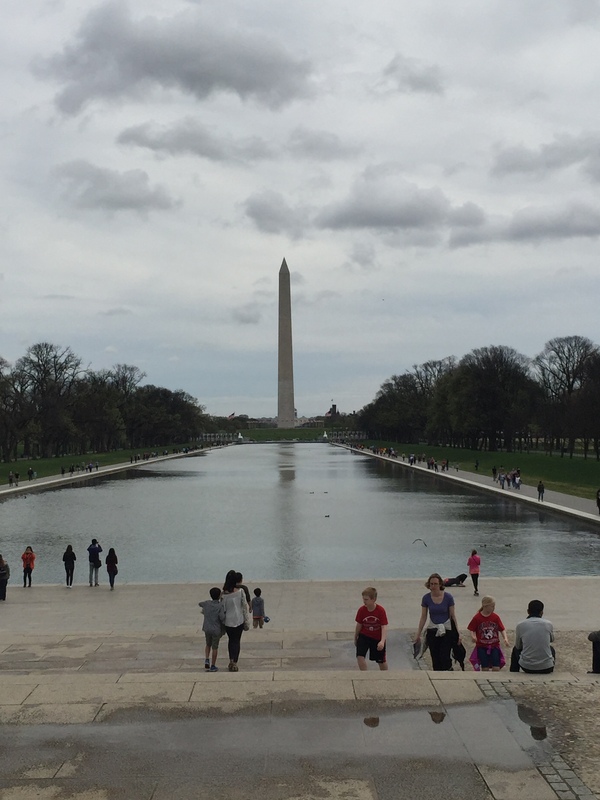 I had been really looking forward to an amazing 18 mile run around Washington D.C.’s scenic National Mall, the tidal basin, and all the monuments along the way. Of course I am incredibly stereotypical and love the Lincoln monument, with the views across the Lincoln Memorial Reflecting Pool and the National Monument standing majestically in the distance. It really does feel like you’re on the set of “House of Cards” or something, and I can’t get enough of the history (however short our nation’s history is in the grand scheme of things). While I lived in the D.C. metro area, I really wasn’t in to running. It seemed like a chore rather than therapeutic. What’s the point in running if you aren’t running to or from something? Well, obviously I have matured from that point. Or something… But regardless, I feel like I may have missed an awesome opportunity, minus the humidity, propensity for rain, and incessant bug population. Oh, and lots of tourists. The main problem with continuing marathon training in another place, however, is you don’t really know where you’re going. 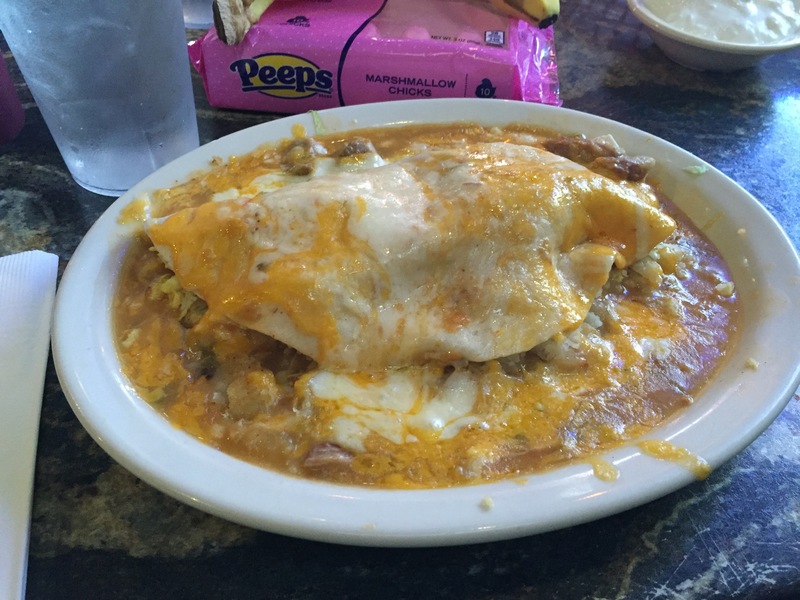 Before travelling to Naples, FL, I meticulously mapped out numerous run options before hand and checked in with my in-laws for recommendations. With D.C., however, I had built in trainers (thank you, Ms. BakeNBurn and Justine!) with extensive knowledge of the area, terrain, and mileage. Literally I just had to follow along (which can be dangerous when you resolve to do 10 miles and your friends want to push you to at least 12, it’s because they love me, I know…). The morning started grey but turned into perfection! The morning of our run was windy and rainy, and I had worried that thunderstorms or excessive wind would prevent me from venturing out. Thankfully the skies magically cleared up just as we got into D.C. from Northern Virginia. I started my run expecting it to be chilly, rainy and overcast, and instead it was gorgeous! We parked along West Potomac Park, on the edge of the Lincoln Memorial. From this point you can run in so many different directions – towards the National Mall, the other monuments, the Tidal Basin, or everyone’s favorite: Hains Point. 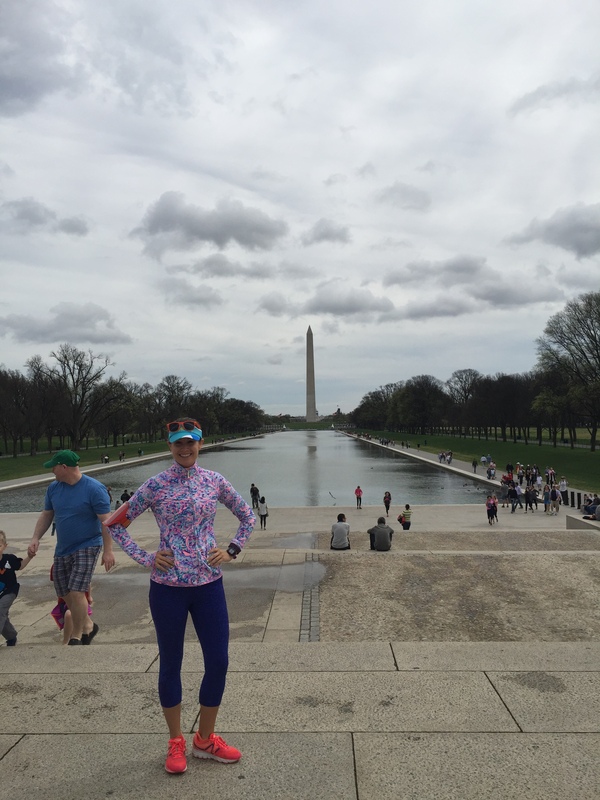 We began by running (and Samantha biking) directly to the Lincoln Memorial. From there, excessive touristy photo-taking inevitably occurred. We then continued along the outside edge of the Reflecting Pool (no bikes allowed on the main pathway), and made our way along the roadway surrounding the National Monument. What I didn’t account for is that because it was spring break for much of the country, and the cherry blossoms were in bloom that week, there were people absolutely everywhere! Sometimes I forget that D.C. is actually a tourist destination. 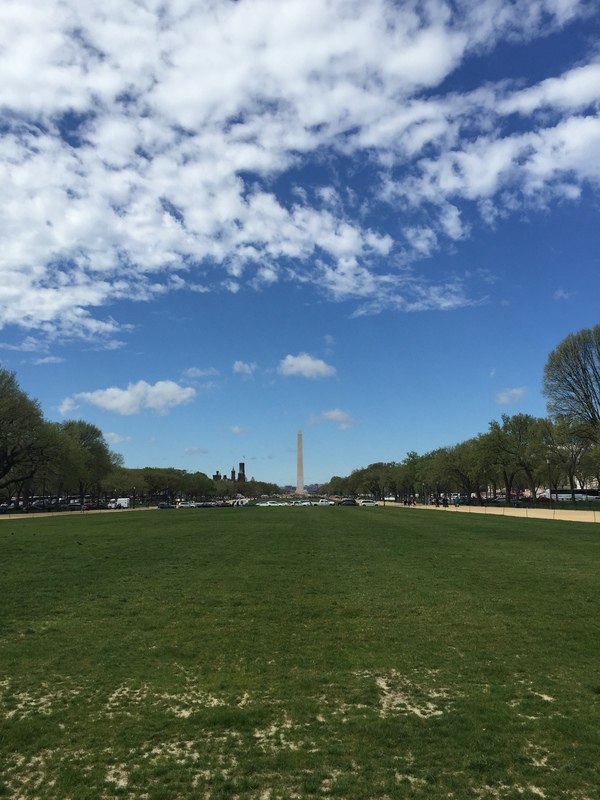 It was really the perfect day for a run around D.C.
New grass could do this mall some good. towards the National Mall. This is possibly my favorite spot in D.C. (stereotypical, I know), nestled between the National Monument and the Capitol Building, sprinkled with some of the world’s best museums (all of which are FREE!). It’s hard not to fall in love with this city when you are walking through so much history. The mall itself is currently being renovated, with a new type of turf and drainage system – a long overdue repair, in my opinion. The mall was fittingly littered with sight-seers and tourists, as well as plenty of fellow runners and fitness enthusiasts. I was naturally in my element. Just cycling through the cherry blossoms. NBD. We ran the perimeter of the mall, crossed back over 14th Street, and turned to the right side of the monument’s encircling pathways. Finally we found a grotto of nearly perfect cherry blossoms! Most of the trees had shed much of their blooms by the time I had arrived, but this group was perfect. So of course Samantha rode her way through them and I got my photo op. I feel like each time I have returned in the month of April I miss the blossoms, so this pretty much made my day. It’s hard to beat this view (obviously I focused my attention on the monument… Whoopsies!). The cherry blossoms in our little hidden grove were so spectacular! We finally made our way back to the reflecting pool and met up with Justine at that point. I might have guilted/coerced/begged her to come run with me. Whatever the case, she joined along as we finished the run. We got a little side-tracked and ended up along the tidal basin overlooking the Jefferson Monument, but got back on course to begin the final stint of the run. And at this point, we had saved the best for last (do you sense a hint of sarcasm? ): Hains Point! YAAAAAY! Here’s my perception of Hains Point – it isn’t so bad. It’s a long narrow point in the middle of the Potomac and is wrapped with water on both sides. It’s scenic, flat, and a golf course runs through the middle of it. 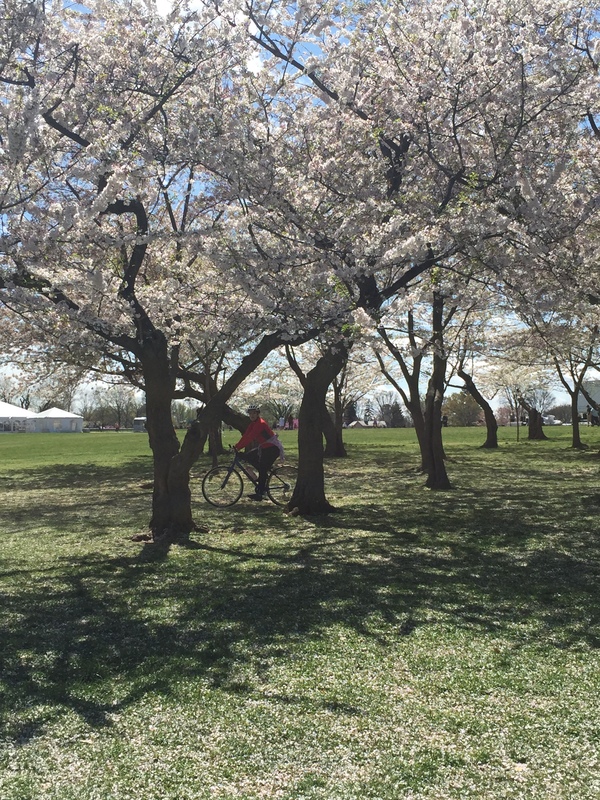 People either hate or love Hains Point. For me it was enjoyable because it was, as I mentioned, extremely flat, and offered gorgeous views with a nice, hefty breeze. Those who are on the loathing camp typically dislike Hains Point because in some circumstances it can seem rather boring. Almost every major race in D.C. uses Hains Point because it is easy for zoning purposes and gets more mileage with little hassle. I personally like that there aren’t that many people, significantly less traffic (almost none), and it really is an easy way to fit in more miles. Samantha, my fearless leader, feels the same way, while Justine could do without it. At Samantha’s suggestion/mandate, I ran down Hains Point and back, Justine begrudgingly yet oh-so-kindly came along for the first half before heading to the car. So what I thought would be about 10 miles turned into 12.31, and I am better for it. I tip my hat to you, Hains Point. I love running along the Highline Canal trail – the mountain vistas are fabulous. I was hoping for, but my view isn’t all that bad either. With snow clouding this weekend’s forecast, I am not sure I will be able to fit in my longest run (I am hoping for 20-22 miles), so I may have to be flexible and move it to the following weekend. Thankfully I have 4 full weekends left of training, and that should give me a bit of cushion before the marathon on May 15th. EEEEK! ONE MONTH! Classy ladies celebrate in the classiest of ways, with lots of wine! The weekend itself was a wonderful success celebrating Christine, the beautiful bride-to-be! Saturday we spent much of the day meandering through Virginia wine country, with stops at Sunset Hills Vineyards, Notaviva Vineyards, and Breaux Vineyards. 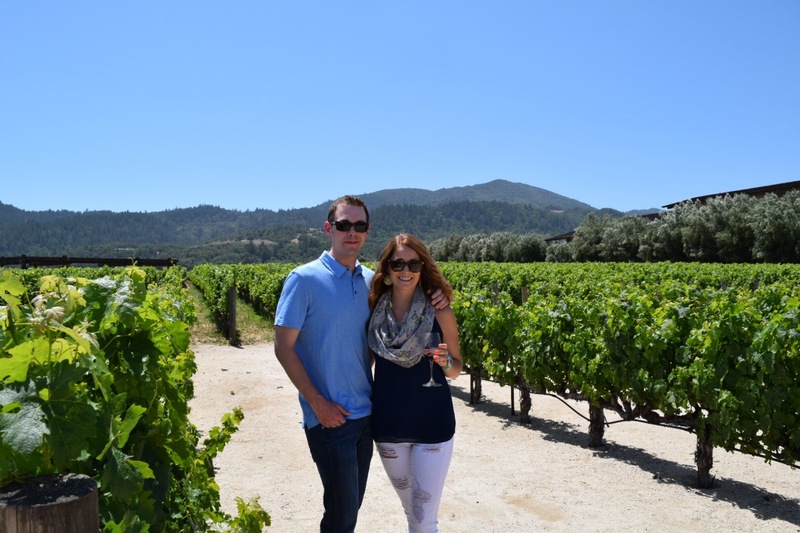 The wines were wonderful, and the company even better. Sunday we hosted the bridal shower, which was a gorgeously themed bridal tea brunch! Anytime you put tea and brunch together, it’s got to be amazing, right? We made lots of scrumptious goodies, had mimosas, and of course, tea. But nothing is better than celebrating an amazing friend as she nears her wedding day! Here are the details for my training plan for the past two weeks. 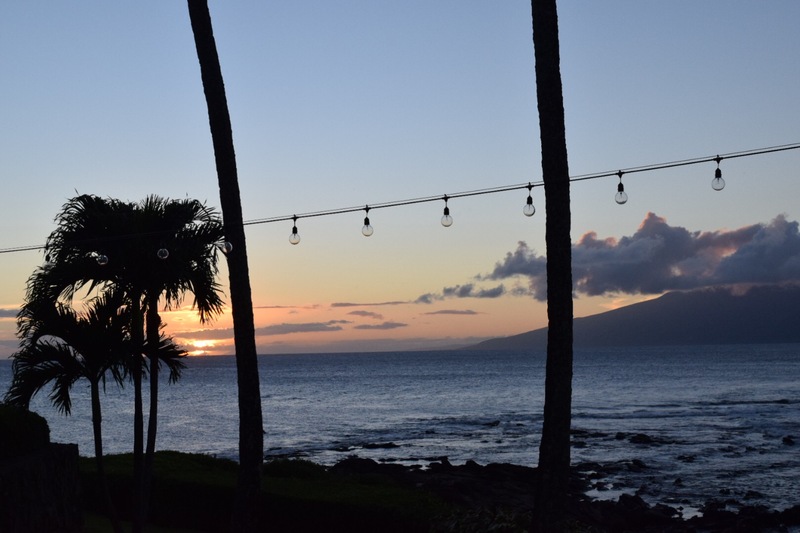 After returning from Virginia I listened to my body and took a much needed break. I was pretty tired after a busy weekend of celebrations, so it was nice to have time to focus on me. And getting plenty of rest didn’t hurt either. I think it helped make my 18 miles last Sunday so incredible. I felt pretty amazing throughout, which I am hopeful is a good sign for the road ahead. Where is your favorite place to run? Have you ever been able to run around D.C.? Who else loves running during their travels? Every person has someone who inspires them. In fact we all probably have many people who inspire us in different ways. For my running “career,” I owe that inspiration to three amazing ladies: Samantha, Justine and Christine. These are my back home gal pals, sorority sisters, and besties who spurred the inner athlete in me. When I moved to Colorado with my hubby in 2011, it was the first time I’d been “away from home” in 13 years. Although I moved with my family a few times while my dad was serving in the Air Force, I’d never been away from my parents, and truly it was the first time I was distanced from my closest friends. Robbie was definitely my rock during that time, but I still wanted to find ways to continue connecting with my besties back home. Yeah, that about sums them up! That year all three of them were ramping up their running game. 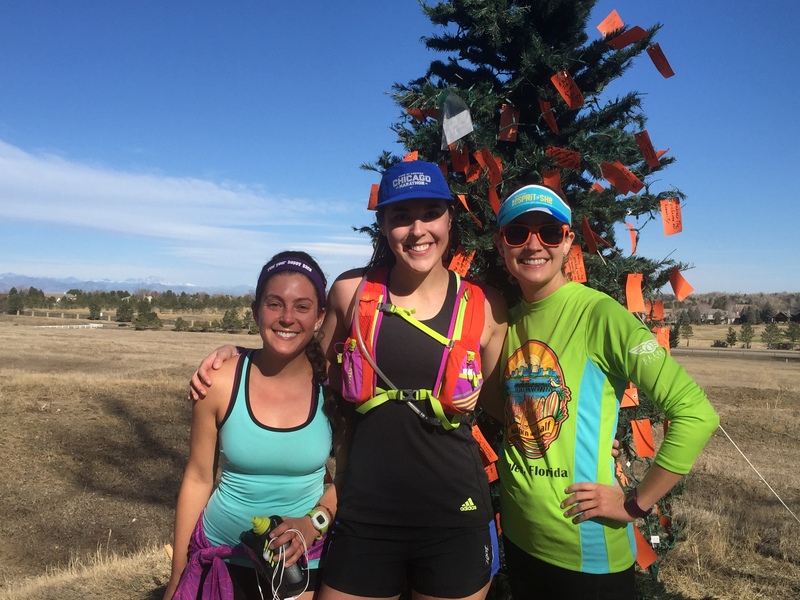 Samantha had been a runner in high school and was diving back in full force, Justine had already completed at least one marathon by that time, and Christine was working towards half marathons the upcoming year. These ladies were my runspiration. Not only did they transform themselves and their lives for the better, but they could share it together! And to be completely blunt, I wanted in on the action. I wanted to know what the heck they were talking about (PR’s, GU, Glide, BioFreeze, foam rollers, and all the other foreign terminologies). Runner’s World actually has a quiz to determine if you speak runner, and at that time, I did not. 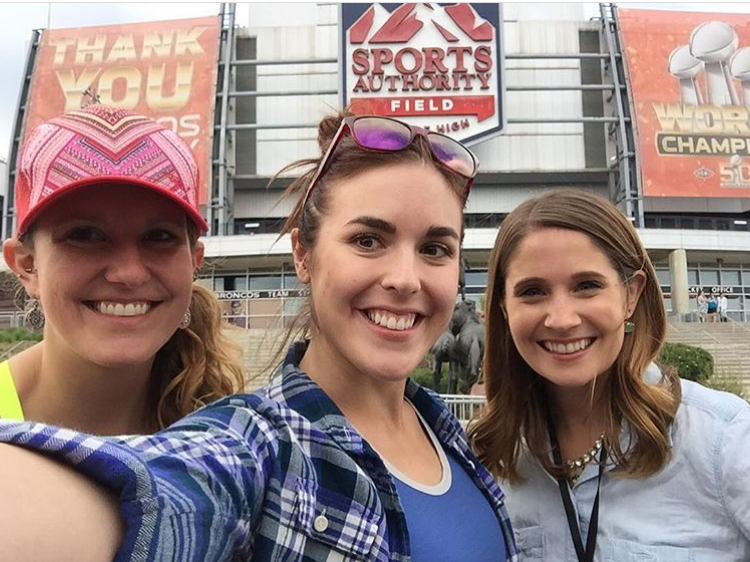 Even from 1,700 miles away, I still wanted to be able to connect with my girlfriends, and share in the new experiences they were having. It may not have been the best motivation, but it doesn’t matter how you get to the race, just that you have the courage to run it. It’s not surprising that they all turned to running. The Washington D.C. metro area is among the top 10 cities in the U.S. for runners, according to Forbes Travel Guide and Active.com (as well as Boulder, CO, my first home in Colorado!). It makes perfect sense, given the numerous lengthy paths and trails, countless races, and the city’s scenic beauty and national landmarks. If only I’d really been into running while I was there! #GoSquad at the Nike Women’s Half. 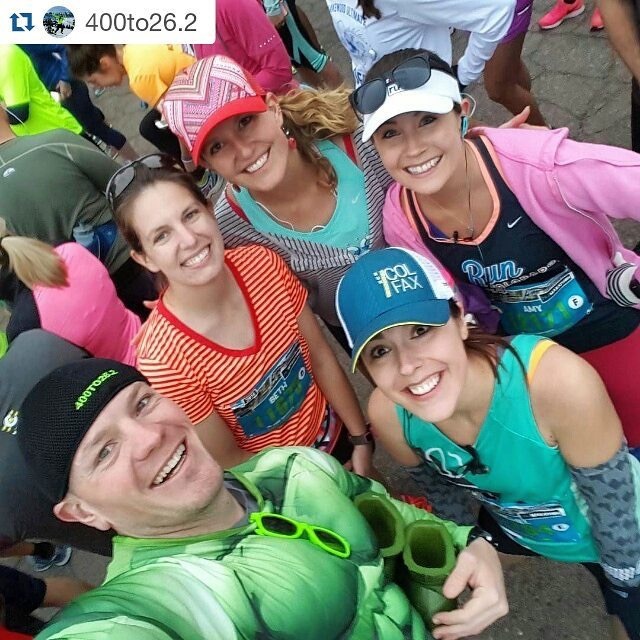 These ladies have inspired my whole running “career”! Women’s Half Marathon, before they discontinued the race in D.C. 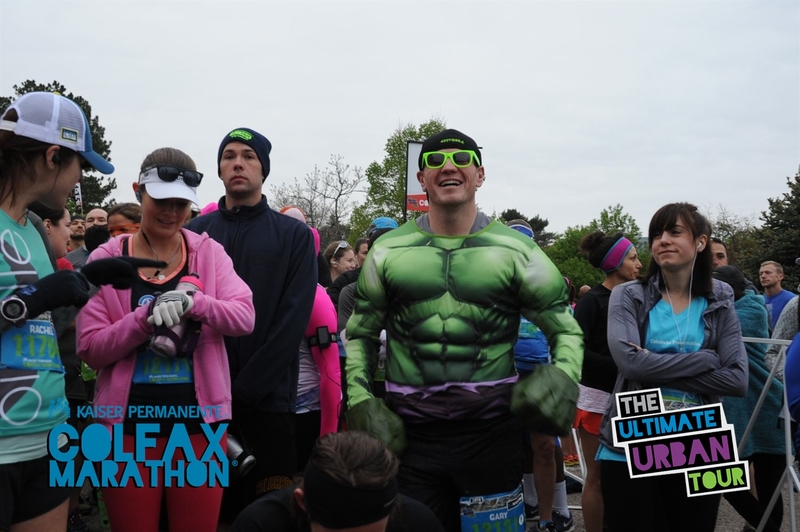 It was the first time all four of us had participated in a race together, and my first race in the D.C. metro area. 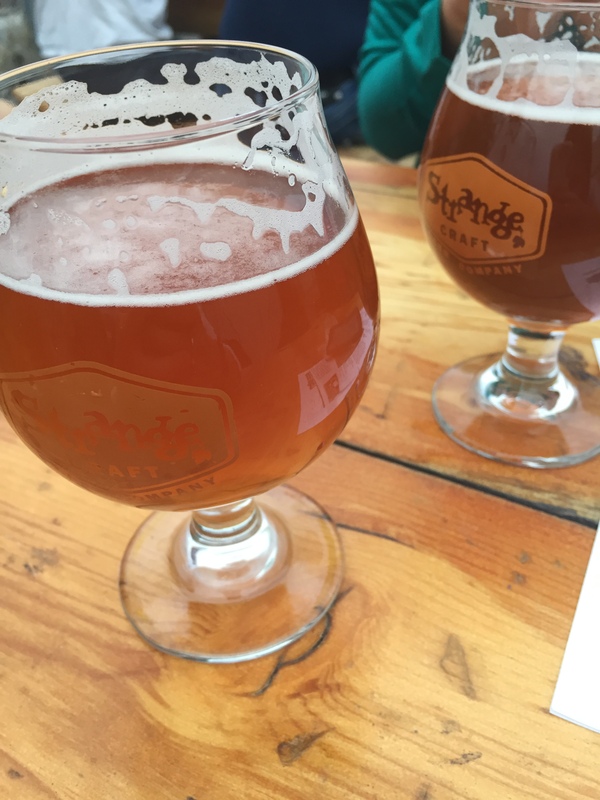 To say shenanigans occurred would be an understatement to end all understatements. There were moments of skipping, Peep eating, and a lot of photo ops. The last time we were together celebrating a beautiful bride-to-be! have an amazing weekend planned for the bride, from a winery tour through Virginia wine country to a bridal tea brunch. I won’t say more, because of course we are hoping for a lot of the elements to be a surprise, but it’s going to be fabulous! The other thing to consider is I am still training for my marathon, and that doesn’t stop even while traveling. Thankfully I will be visiting ladies who know the area, know the trails and have trained in this city for marathons of their own. Sunday’s run was not only shortened, but I had to forgo running on my usual trail. SO MUCH SNOW! of work and personal issues. Even when I tried to fit in a 14 mile run this Sunday, my usual trek along the Highline Canal Trail was completely covered in ice and frozen-over snow. Needless to say I turned around after two miles in and finished my run on pavement. Every runner, every athlete, nay every human experiences an off week. It’s how we bounce back and not let it bring us down that defines us. So I am moving on and letting this week be a good one. Because let’s be honest, we are hardest upon ourselves. No one else is going to judge my progress or feel guilty about not fulfilling my goal except for me. So why carry that burden and let it affect the rest of my training? No one has space for that kind of mentality in their lives. Furthermore, I am hoping that this week I will be able to fit in 18 miles while visiting in D.C. Weather is extremely permitting, with thunderstorms clouding the forecast. The weather gods may need a serious sacrifice… My friend, Samantha, has it all planned out and is going to bike along with me on the Mount Vernon Trail if all goes well. 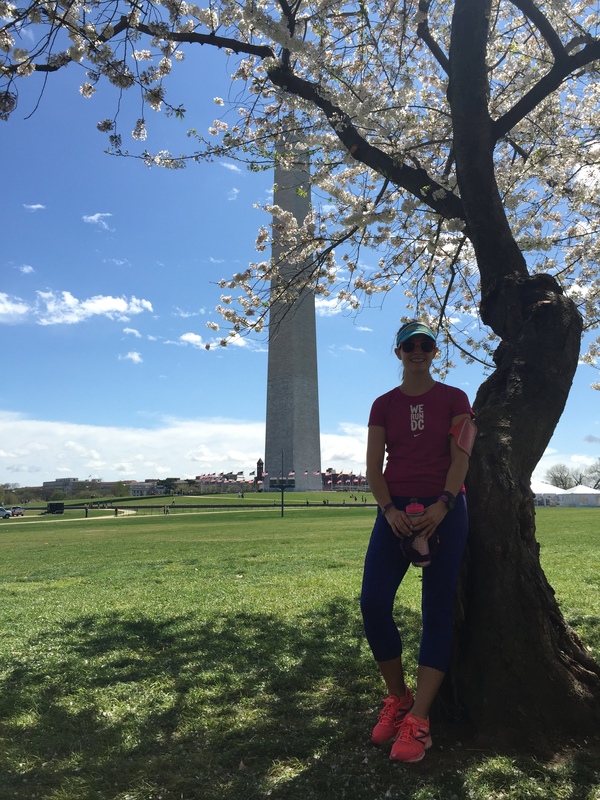 I am hoping to be able to run past monuments and the tidal basin, currently blooming with cherry blossoms. It would be nice to switch it up, and running at sea level doesn’t hurt either! These days, though, I have many runspirations. My hubby is probably my biggest supporter and source of encouragement. 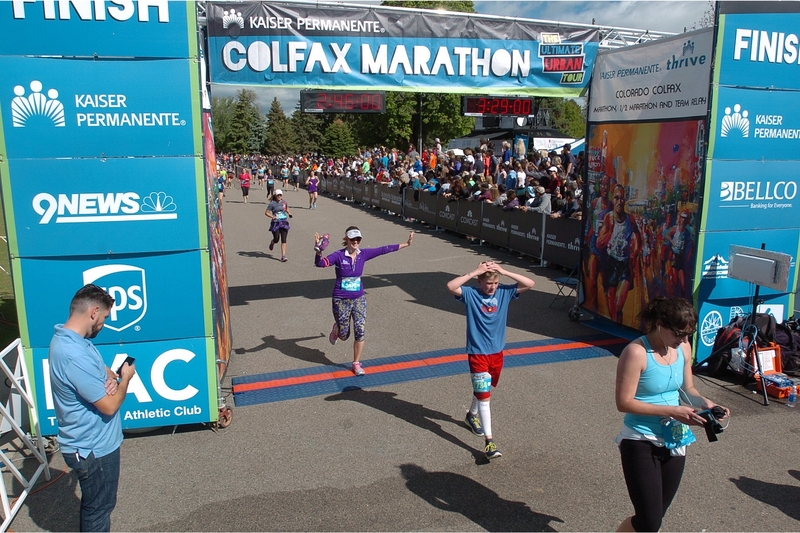 He and I have been training together for the Colfax Marathon, and it makes the miles all the more wonderful to share them with him. He has been my rock and motivator this entire time. Often he will tell me, “I only started running because of you,” and I know it’s true. Better still is that is gives us another way to spend more time together. And I wouldn’t trade that for anything. 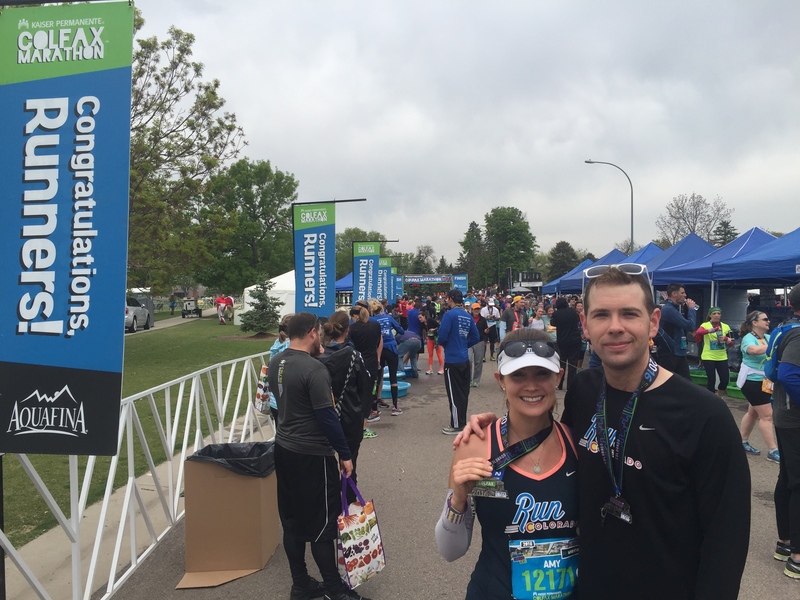 Our second Denver Rock ‘N’ Roll Half Marathon together in October 2015. Here’s last week’s recap – on to a bigger and better week of training! Have you ever had just incredibly off weeks when training? 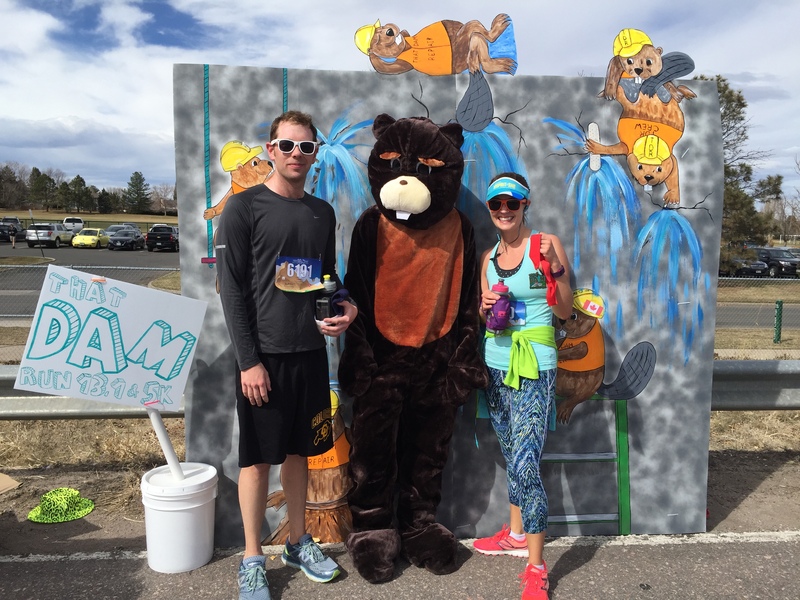 Who is your runspiration? Do you speak runner?